Custom Rifles was a tour de force in the world of customized rifles when it was originally published in the 1950s, and it is still relevant today. The custom rifle is much more than just another shooting implement. Certainly, accuracy may be greatly improved over a particular rifle's off-the-shelf cousins, but the main reason that people customize rifles is to take advantage of the skills of the individual gunsmith and stockmaker to produce something that fits the individual needs of the owner. In this book, noted author and rifleman Jeff Cooper explains the different designs of action, custom barrels, the best types of wood for making stocks and of course the popular calibres of ammunition in use at the time, many of which are still with us today. Custom Rifles is more than just a book for the would-be customizer. It offers excellent information on what improves or affects the performance of a fine rifle. A listing of members of the American Custom Gunmakers Guild and the work they perform. Selecting and Ordering a Custom Hunting Rifle. Sisk. John wrote several chapters and shorts, including ones on controlled-round feed vs. push-feed, reality vs. expectations when buying a custom rifle, wildcat cartridges, walnut stocks, and scopes for custom rifles. He also takes on the big question: Should you buy custom? And I wrote the chapter on fit, good fit, for both men and women. Sisk says, "It may look like any idiot could do what I do, but it takes years of study and watching people mount and use guns to know what to look for and turn around and fix it right." I've listened to Charlie's philosophy of fit for years, and shot his guns. Maybe this book should have been called Zen and the Art of Rifle Guns. Michael Petrov was a collector, shooter and historian specializing in custom bolt-action and single-shot target rifles. His fine collection of sporting rifles was sold recently at auction. 208pp, profuse color photos, hardcover, dj. Custom guns take many forms and exist on many levels. From an unassuming but meticulously crafted and hand-finished rifle built for the world-traveling hunter, to an ornately engraved rifle with fancy stock carving fit for a collector or king, custom rifles, handguns, and shotguns are the stuff every gun owner's dreams are made of. Creating such finery is the purview of just a handful of artisans, and no one knows them and their artwork better than renowned author and firearms expert Tom Turpin. Having invested decades in pursuit of perfection in riflecraft, Turpin has close relationships with many of today's best stockmakers, metalsmiths, engravers, and other specialists, as well as knowledge of the gunmakers of yesterday who left indelible marks on the firearms world. With this volume he brings the work of his friends and colleagues to life in beautiful prose and exquisite photography. Whether you are looking for an artisan to build your first custom creation, or you have a safe full of custom guns, or even if you just wish you did, this is a book to savor and cherish. As the author himself suggests, "Sit back, relax, and enjoy." Steven Dodd Hughes. Hardbound. Excellent preparation for anybody, beginner and experienced collector alike, considering purchase of a high-grade double shotgun. Author shares accumulated knowledge and wisdom from 30 years of collecting, building, repairing, and customizing doubles. 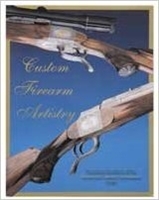 Covers repairs and restoration, custom projects, history and function of classic sidelock action and modern variations, profiles of two modern Italian custom makers, the art of stockmaking, restoring and preserving metal finishes, plus plenty of detailed “case studies” that’ll help you spot problems on used doubles and avoid ending up with an expensive and pretty, but unshootable, wall-hanger.